UAMS AR-IMPACT, nearing its one-year anniversary, received continued funding from the Blue & You Foundation. 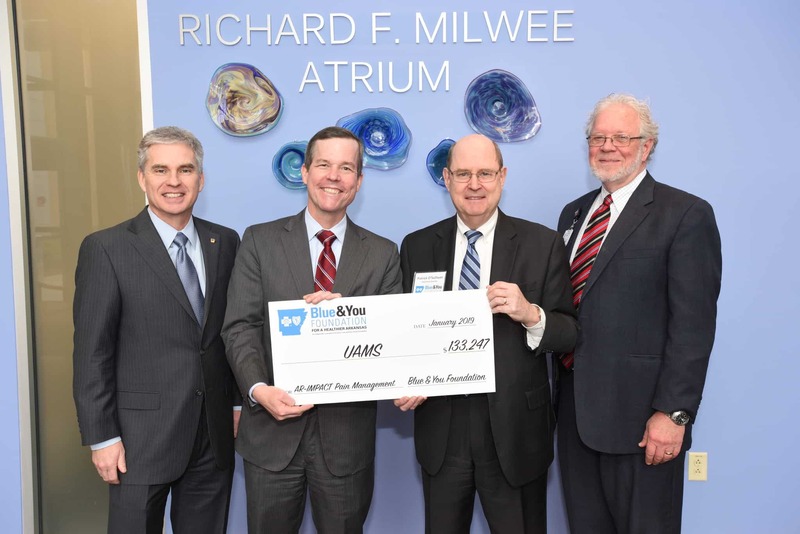 From left, Curtis Barnett, Arkansas Blue Cross and Blue Shield president and CEO; UAMS Chancellor Cam Patterson, M.D., MBA; Patrick O'Sullivan, Blue & You Foundation executive director; and G. Richard Smith, M.D., director of the UAMS Psychiatric Research Institute, at the check presentation held Jan. 14. Jan. 15, 2019 | The UAMS AR-IMPACT program, nearing its one-year anniversary, has a prescription for health care providers: use each week, as needed. Physicians and specialists have taken advantage by video conferencing in from across the state as they battle the opioid epidemic. Through free weekly live video conferences hosted by a multidisciplinary and interprofessional team of UAMS specialists, state health care providers learn more about opioid treatment and addiction and get individualized feedback for their own patient cases. Initial funding was provided by Arkansas Blue Cross and Blue Shield and the office of the state drug director. This year, continued funding is provided by the Blue & You Foundation, Blue Cross and Blue Shield’s charitable arm. Members of the foundation presented a $133,247 check to UAMS representatives Jan. 14. UAMS AR-IMPACT (Arkansas Improving Multidisciplinary Pain Care Treatment) is one of the latest of UAMS’ efforts to respond to the opioid epidemic, which include reducing opioid prescriptions while improving patient outcomes, re-educating staff, treating overdose patients and treating opioid addiction through medical and group therapy. Research to improve understanding of opioid addiction and its treatment is ongoing in departments across campus. The initiative was announced in April at the state Capitol with Gov. Asa Hutchinson, Arkansas Blue Cross and Blue Shield, and partnering agencies: the Arkansas Medical Society, Arkansas Academy of Family Physicians, the Arkansas State Medical Board, the Arkansas Department of Human Services and the Arkansas Department of Health. “It’s understandable that it’s hard to implement that in general practice, but hopefully we’re on the forefront of saying, if we’re really wanting to curb the opioid epidemic, we need better ideas and models on how to adequately treat chronic pain,” Hayes said. Arkansas ranks second in the nation for its opioid prescribing rate with an average of 105.4 prescriptions per 100 people, according to U.S. Centers for Disease Control and Prevention (CDC) data from 2017. Although it represents a decrease from the state’s previous three-year average of 114.6 prescriptions, there is still work to be done. There were an estimated 130 deaths each day from opioid-related drug overdoses in the United States in 2016-2017, according to the U.S. Department of Health and Human Services. Opioids were involved in more than two-thirds of all drug overdose deaths in the United States in 2017. Arkansas had 446 deaths in 2017 as a result of a drug overdose, according to the CDC. Each weekly conference includes a 20-minute presentation on an opioid-related topic, as well as a question-and-answer session where participants present their own patient cases for feedback. Topics from the past year included chronic pain and identifying addiction, physical therapy, medical marijuana, addiction during pregnancy, and the intersection of opioids and mental health. All previous presentation slides and recordings are available at arimpact.uams.edu. The video conferences are helpful particularly for rural health care providers, who do not always have access to larger clinics and hospitals for consultations or referrals. Simply click a link on the UAMS AR-IMPACT website and join in; it’s that easy, Hayes said. In just eight months, physicians, pharmacists, nurses, physician assistants, occupational and physical therapists, psychologists, toxicologists and social workers earned 365 continuing medical education credits from using the service. With such a strong response from the community, the next step is building on that momentum and increasing participation, Hayes said. Addressing difficult cases with peers is perhaps the best use of the program, Hayes said, because collaboration across multiple disciplines happens in real time. An example of a patient case might include an elderly patient with severe pain who has tried methods ranging from medication to counseling to physical therapy, Hayes said. If the patient is taking a higher dosage of opioids, the provider might ask whether the dosage was appropriate and what other medications or strategies are available. The panel then makes recommendations and referrals that would not only benefit the patient but help to reduce their dependency on opioids, giving the provider more options to manage their patients’ pain. Access to services is a common issue, so the panel works to find resources closest to the patient. The end goal is the same: to effectively manage chronic pain and reduce dependency on opioids, regardless of discipline or specialty. “We are all in this together: to effectively treat pain while decreasing dependency and addiction to opioids,” Hayes said.